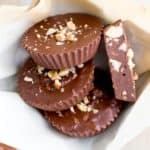 Gluten Free Vegan Chocolate Peanut Butter Truffles (V, GF, DF): an easy, 5 ingredient recipe for decadent peanut butter truffles dipped in chocolate. Vegan, Gluten Free, Dairy-Free. There’s just something about this season that puts an extra pep in my step. It could be the fact that I’m gonna spend some actual quality time with my family soon. Or, that everyone seems more giving, more open, more… prone to bouts of laughter and cheer. Or, the fact that everywhere you look, buildings, toys, food, people, pets and more are wrapped up like the perfect present. And if you’ve been around here, patiently reading my babble, you know that we’ve been burning the midnight/morning/afternoon/are-there-any-other-timeslots-I’m-missing oil since… well, who can even remember? We both tend to be a bit hard on ourselves and are always, unfortunately, looking for new ways to please people (so not cool, I know). But that one Monday… well, that one glorious Monday, we called the day off. Nice and early. See what the holiday does to us? 🙂 Does it do the same for you? Do you feel more than an inkling to clock out early, maybe have two extra vegan chocolate cupcakes, or perhaps treat yourself to those Hamilton tickets you’ve been eyeing for ages? Or maybe you just let yourself stay in bed that extra cozy 10 minutes? Those last 10 minutes are truly the best. 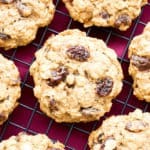 Maybe you’ll take an entire day off to make gingerbread houses or no bake oatmeal peanut butter cookies. Whatever it is you do, I hope you do it. Often and with merriment. I mean, what other time of the year can we use merriment as an excuse anyway? 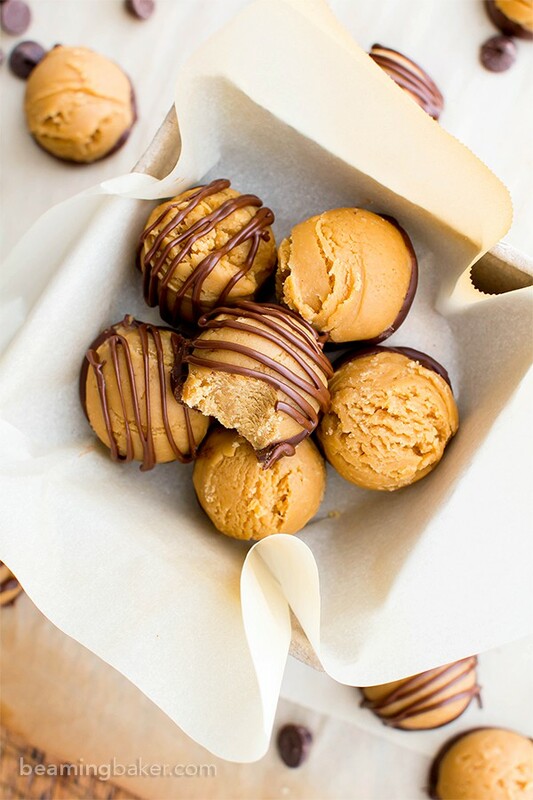 Anywho, while I was in the midst of making the final photoshoot-ready batch of these Gluten Free Vegan Chocolate Peanut Butter Truffles, I got to thinking about all the fond memories I have of Christmas time. Side note, how awesome/unusual is it that Christmastime is actually one word? Because that’s how BOSS the holidays are, folks. Eh… there I go, veering slightly off track again. Um, as I was saying (see what an extra 10 minutes in bed gets you??? 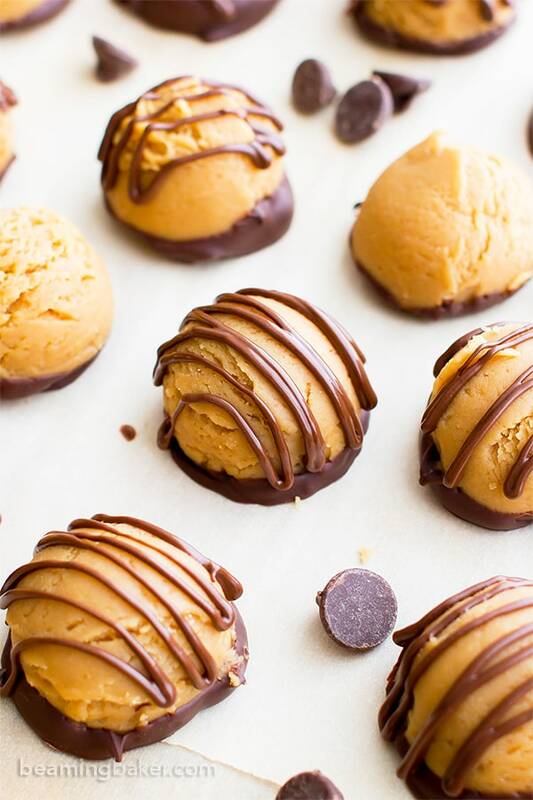 Vacation Mind), I was making these gluten free vegan chocolate peanut butter truffles and it got me thinking about the wonderful times I’ve had with my family. Okay, I’ve got to warn you, or rather, my sisters that this is gonna get embarrassing. So, obviously, I’m gonna need to put my phone on silent for the next two days… It’s best to ignore these type of things. Ahem. A few years back, when we were even less mature than we are today (if you can imagine), we’d have an annual Christmas Day tradition: after opening presents and cleaning up the sea of gift wrap, candy and All the Christmas Novelty Socks in All The Land, we’d get super cozy. Newly gifted pajamas and previously aforementioned Christmas novelty socks on, contacts off and glasses on for maximum relaxation, I would bring out a one pound box of truffles. Jenny would bring out the latest season of 24 on boxed set. Monica would warm up our old, belovedly boxy TV. Penny would grab the salty treats. And we would proceed to watch all of 24. Yes, all 24 episodes, with that entire box of truffles and plenty of salty snacks for balance, of course, and finish it all off in 2 days. Or some amount of days. It was all a salty/sweet, cozy blur, tbh. I mean really, who can remember when they’re marathon-watching 24 whole episodes of a series? And yeah, I guess people aren’t too shocked by this nowadays, but this was back in the day when there was no Netflix (okay, there was Netflix, but only seriously dodgy titles available), no streaming, none of that. We’d literally be unwrapping the actual box set of whatever season we were on, and insert a DVD. Oh, the effort of unclicking that DVD and not accidentally snapping the holder… What can I say, we were dedicated. And very strong, apparently. I remember nodding off for so many hours and feeling like I was Jack Bauer. Saving the world, one truffle at a time. One excruciatingly thrilling episode at a time. We’d watch well into the night, and one or three of us would throw in the towel and go to bed… but one of my sisters (I’ll let you guess who) would carry the team through the night. She was our very own Jack Bauer. At 6 in the morning, we’d started trickling back downstairs to the TV, and there she’d be, still watching. Dedicated as ever to her mission. She’d recap us all on what happened during the 4-6 episodes in which we were so lamely sleeping, and offer us the last few truffles, with a crazy look in her eye. By the end of those two-ish days, the truffles were all gone, Jack and my sis finally saved the world, and we all looked like we’d been through finals. Hair all mussed up, new pajamas and cozy socks looking like they were decade-old favorites, and Christmas a thing of the past, with New Year’s Day right around the corner. A throwback pic of my sisters and me: Jenny, Penny, Me and Monica. Excuse the slightly sinister look in my eye. I actually think I’m posing attractively. 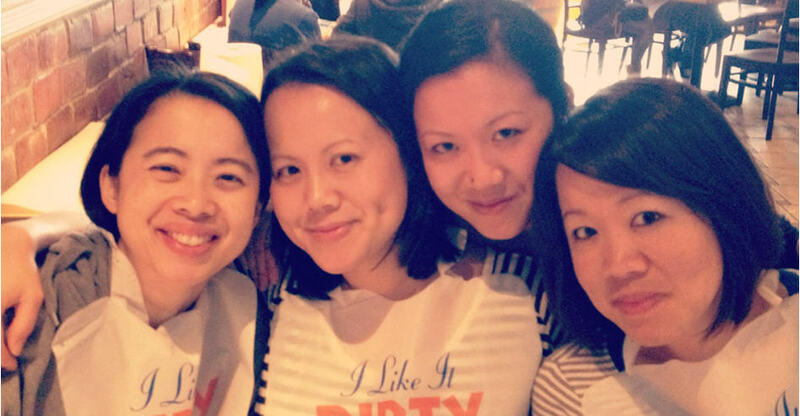 And yes, we are ALL wearing bibs! For eating, of course. Now that we’re all older, we don’t do that anymore (much to You Know Who’s dismay)… but we’re creating new traditions every year. This year will be our first year not all getting together as a family. I’m probably feeling a bit too nostalgic for those days, but I’m also so happy that my sisters have created their own families, with so many new and wonderfully embarrassing memories to come. How about you? Are you planning on any fun kitchen activities with the fam? 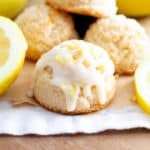 I hope you just love this recipe. So far, my family has already put in refill requests for these, like I’m a subscription plan! Oh, them! 😉 Thank you so much for coming over and spending some time with me here at the blog during this fantastic season. I can’t wait to hear all about the new memories you make this year. In the meantime, tell me, what do you get to reminiscing about this time of year? 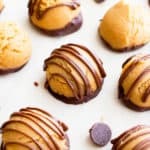 Gluten Free Vegan Chocolate Peanut Butter Truffles (V, GF, DF): an easy, 5 ingredient recipe for decadent peanut butter truffles dipped in chocolate. Vegan, Gluten Free, Dairy-Free, Holiday. Line a baking sheet with parchment or wax paper. Set aside. Clear some space out in the freezer for this pan—you will need it later. 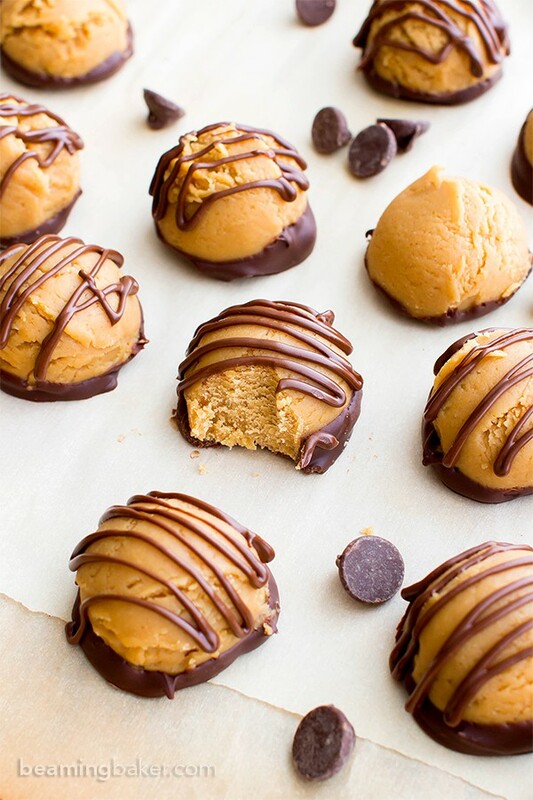 Make the peanut butter balls: In a medium bowl, add peanut butter, maple syrup, and coconut flour. Whisk until thickened and difficult to stir. Switch to folding with a rubber spatula until well-incorporated. Cover and freeze for 15-20 minutes. Remove from freezer. 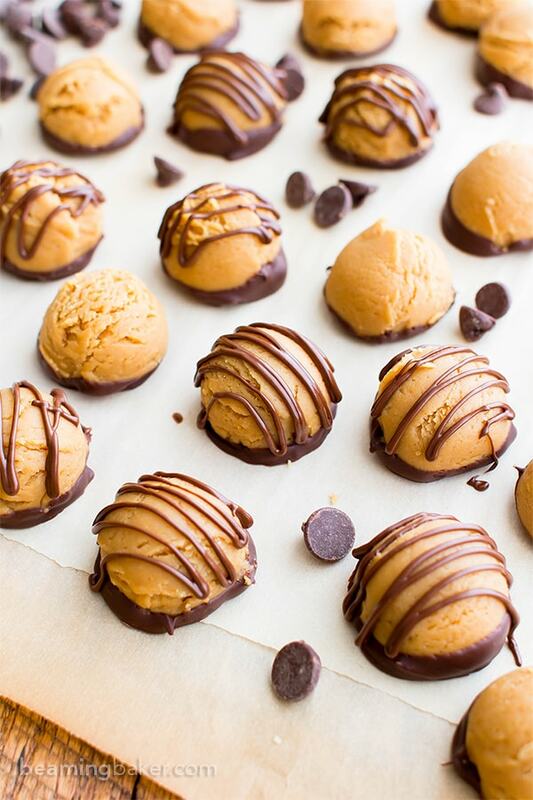 Using a 1-tablespoon cookie scoop, scoop and drop peanut butter balls onto the prepared baking sheet, spaced evenly apart. Transfer back to the freezer to chill for 20-30 minutes, until hardened. About 5 minutes before the balls are done freezing, it’s time to make the chocolate dip. 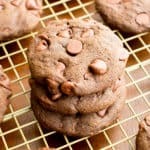 Make the chocolate dip: Use the double boiler method or the following. Add Chocolate Dip ingredients to a medium, microwave-safe bowl: ½ cup chocolate chips and ¼ teaspoon coconut oil. Heat in 20-second increments until chocolate is softened and melted. Stir in between heating, until smooth. Remove peanut butter balls from freezer. Dip the bottom of one ball into the bowl of melted chocolate, scraping off excess. Place back onto the prepared baking sheet. Repeat until all balls are dipped. There should be leftover melted chocolate. Make the drizzle: Add Chocolate Drizzle ingredients to your bowl of leftover melted chocolate: 2 tablespoons chocolate chips and ⅛ teaspoon melted coconut oil. Heat in 20-second increments until softened and melted. Stir until smooth. Spoon melted chocolate into a small zip bag and trim a tiny corner off. Pipe chocolate in a zigzag pattern across the top of each truffle. Freeze for 10-20 minutes. Enjoy! Storing instructions below. 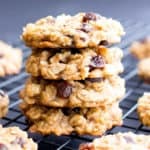 - Adapted from my No Bake Chocolate Peanut Butter Bars. - Homemade Candy: Coconut Chocolate Truffles, Peppermint Crunch Bars, Paleo Almond Joy, Paleo Almond Butter Cups. 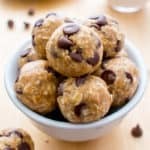 - Peanut Butter Love recipes: no bake chocolate pb bars, peanut butter chocolate chip oatmeal breakfast bars, peanut butter ice cream smoothie. We love baking sugar cookies, cutting them out and decorating them. It’s a huge mess, but the kids love it and any remaining cookies are left out for Santa. After all, he deserves it! These look so yummy I would have to give them all away…since I can’t trust myself. That sounds like so much fun! I absolutely love family baking/cooking activities. There’s just something so satisfying about it all. 🙂 <--Best bonding time, like ever! Santa definitely deserves it! 😉 Haha. Thanks so much Karen! 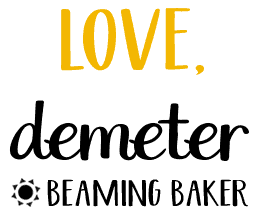 I love your description of the holidays, Demeter! It really does seem to bring out the best in most people. And yay for you and Eric for taking a half day, on a Monday, no less! Pretty much the best way to break into the week. I’ve been feeling the Christmas spirit this year and am more inclined to relax a little more and enjoy the season. 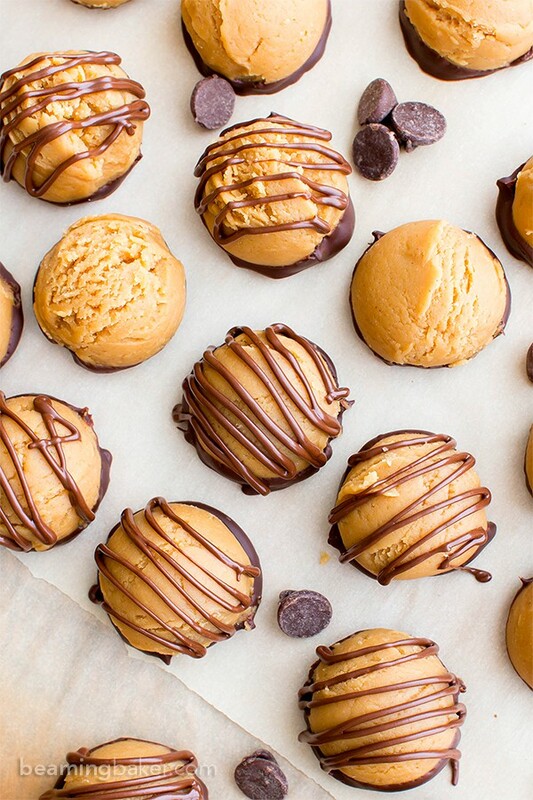 And these truffles…WOWSERS! Amazing, my friend! 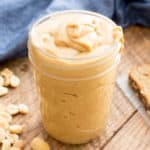 I’m loving all of that peanut butter in here. And they’re so pretty, too! What a perfect gift for the season, or just to devour them all myself, because I know I would! 🙂 Pinned, of course! Hope you have a great weekend! Thank you so much, Marsha! 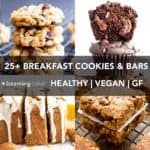 🙂 You and I share a most fervent love of chocolate + PB, that’s for sure! 🙂 Big hugs! 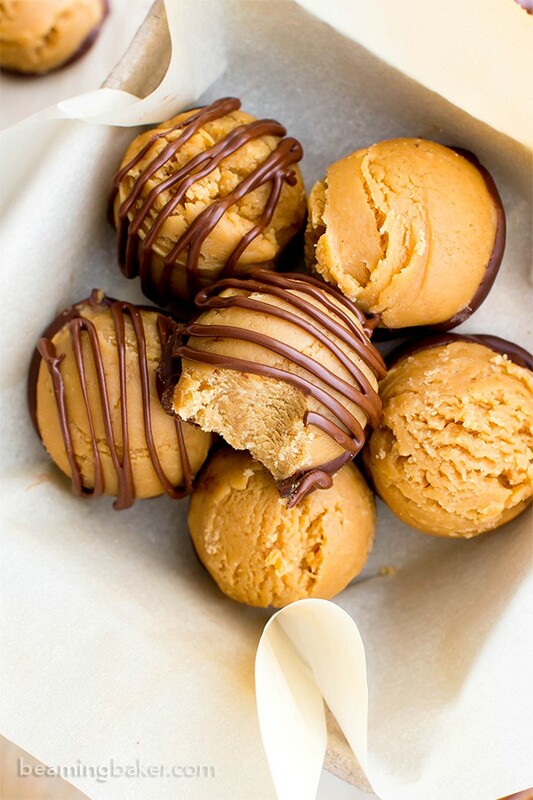 Peanut butter and chocolate is perfection! 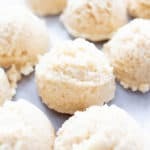 These truffles look perfect! Wow Demeter that looks amazing! Love your recipes. Just made these, and they’re awesome! Thanks so much for the simple, delicious recipe.